Mental illness is a highly controversial and contested field, informed by the ideas and research of academics and practitioners working in psychiatry, psychology, pharmacology, sociology, genetics and the neurosciences. This book brings clarity to a complex field, exploring core issues ranging from debates about the way the concept has been developed and expanded over time to controversies over the causes of mental illness. The author evaluates critiques of the concept of mental illness and of the way its expanding boundaries now define a far wider range of mental states, experiences and activities as pathological. Arguing that these boundaries need to be restricted, the author contends that many of the phenomena identified as mental illness are normal reactions to life's difficulties and that, while individuals may need support, it is not appropriate or helpful for such phenomena to be treated as indicative of mental disorder. Other important topics covered include the way mental illness is measured, its distribution across populations and over time, and the different types of care provided for those with identified mental illness. Mental Illness will prove invaluable for intending practitioners in medicine, psychiatry, mental health nursing, social work, and clinical and health psychology, as well as for students in psychology, sociology and the health sciences. Joan Busfield is Professor of Sociology at the University of Essex. "Accessible yet rich, and consequently as valuable as, if not superior to, the similar texts that have preceded it. It will be of use to both groups of readers, those who are familiar with the material covered in it and those who are not, and is thus well-suited to the needs of a diverse professional audience." "The relabelling of human distress and eccentricity as mental disorder is one of the great social changes of our time. 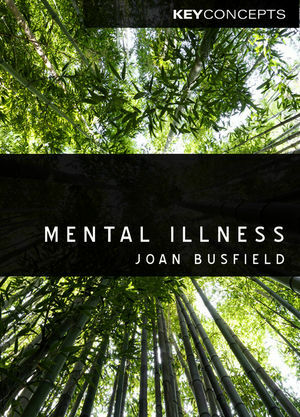 Joan Busfield provides a breathtakingly lucid and remarkably comprehensive analysis of the vast cross-disciplinary terrain of argument about mental disorder and the meaning of the enormous expansion in disorder diagnoses over the past half-century. Busfield brings not only her sociologist's accomplished eye but also her trained clinician's understanding and a deft wielding of conceptual distinctions to the multifaceted debates over the meaning and social impact of mental disorder." "Busfield has managed to capture in a single volume the breadth and depth of the highly contested and complex concept of mental illness. Original, accessible and engaging, this important book is a must-read." "Busfield's book provides a valuable overview of the contested nature of mental illness, offering a balanced critique of some of the key debates regarding psychiatric concepts and categories. She cautions against the extension of psychiatric boundaries to include those experiences that are more helpfully understood in their social context, emphasising the contribution of many complex factors to the classification of mental illness. Her book deserves to be read by anyone interested in mental health and illness, including professionals and students." A concise and sophisticated introduction to the contested concept of ‘Mental Illness’. Brings together a range of insights and interpretations from various disciplines including sociology, psychology, psychiatry and the neurosciences. Accessibly combines theory and practical examples to demonstrate the nuances and complexities of different approaches to mental illness. Written by a leading expert in the sociology of mental health.